(Nanowerk Spotlight) Defined as a clouding of the lens of the eye, cataracts affect more than 20 million people worldwide and accounts for 51 per cent of world blindness1. In fact, this debilitating eye disease has been identified as the leading cause of blindness today and is a growing concern for global populations due the profound impact loss of vision has on quality of life for both patients and their dependents. Although the disease may also occur at birth or after an injury, it is typically associated with the aging process and most prevalent in senior citizens. Recent studies indicate that people aged between 55-64, 65-74 and 75+ have incidence rates of 45, 75 and 88 per cent respectively2. This is concerning as it indicates that nearly all of us will deal with cataract formation at some stage in our lifetime. In addition to robbing patients of one of their five senses, cataract formation carries a significant economic burden. Those affected will incur costs associated with direct surgical treatment as well as patient and family support, loss of work and in some cases, increased social payments. While this is problematic, people in developing countries, where the incidence of eye diseases is often elevated due to malnutrition, limited health and education services, poor water quality and lack of sanitation, face an even more desperate situation. In these regions, surgical cataract treatment is often far too costly for an individual to bear. And since those with the condition will likely experience a loss of vital income, the possibility of families being relegated to extreme poverty is high. 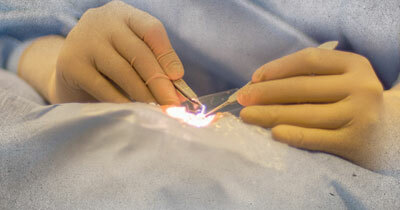 Currently, the only available cataract treatment is surgical removal. Eye surgeons will excise the cataract and abnormal lens, and replace it with a synthetic intraocular lens to restore transparency. The day surgery procedure is usually performed under local anesthetic and patients are discharged with prescription drops and painkillers for a swift recovery at home. Although this strategy has been reasonably effective in developed nations, innovative cataract treatments are required to help to reduce the added burden aging populations are placing on existing health care systems. Alternative strategies are also paramount in developing countries where access to trained surgeons is limited and the cost of surgery is prohibitive. A lot of effort has been expended to date, trying to improve the treatment of cataracts through optimization and simplifying of current surgical procedures. The logic is that any reduction in cost and surgical time will make this treatment easier and more accessible. While it is true that more efficient surgical procedures will increase access to treatment, in order to affect the significant percentage of the world’s population afflicted with this issue, it is clear that a non-surgical treatment is necessary. 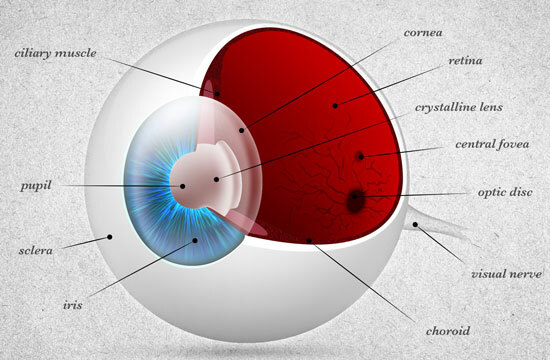 In healthy individuals, the eye lens is a transparent tissue that focuses light onto the retina. The transparency of the lens arises from fiber cells, which are composed of highly concentrated crystallin proteins3. These proteins, combined with a high concentration of chaperone proteins , facilitate lens maintenance and repair any misfolding of structural proteins4. In a healthy eye, the protein organization and structural stability should be maintained for lifetime. Through the aging process, lens crystallin proteins are covalently damaged and modified by exposure to environmental factors such as UV radiation. These alterations result in protein insolubility and aggregation, which changes the refractive index of the lens and impairs vision. Accordingly, protein misfolding, insolubility and aggregation are considered the pathology causing the eye disease, thus inhibition of aggregate formation and/or its destruction is the treatment. Using biological/chemical chaperones and chemical compounds that enhance chaperone activity, scientists have been able to inhibit aggregate formation. In addition, compounds known to disrupt β-sheets have been shown to play a significant role in stabilization of the native conformation or destabilization of the misfolded structure and underpin fibril dissociation approaches5. The screening of small molecules that inhibit protein aggregation is also a technique that has been garnering attention but until now, screened molecules have commonly been chemical compounds and the process has been mainly applied to whole cells6. As such, the detailed inhibitory mechanism of drug candidates hasn’t generally been considered, limiting further improvements using this strategy. 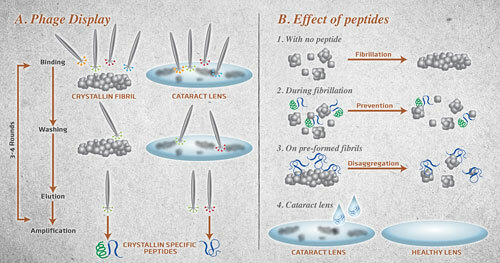 At Ingenuity Lab in Edmonton, a multidisciplinary team of researchers with partners in Alberta, U.S.A. and Nepal, are busy trying to understand the fundamental mechanisms of how the aggregates that cause cataracts form, and how nanotechnology may be used to prevent or at least inhibit them. Researchers are taking lessons learned from earlier discoveries and have honed in on target specific peptide screening techniques in the hopes that they will provide a much-needed solution for communities around the world. The work aims to harness the specific binding abilities of peptides for recognition of crystallin protein aggregates7, as well as the unique peptide characteristics that influence stabilization of protein/aggregate and activity depending on the binding region8. This research is encouraging because it recognizes the potential of crystallin specific peptides not only as drug delivery mediators but also as aggregation inhibitory molecules. Using combinatorial biology approaches, the team has is working to select peptides in both recombinant and ex vivo systems. Once the specific peptides are chosen, their effect on the aggregation process is will be carefully followed by in-situ time sequenced atomic force microscopy visualizations. These peptides will then be screened for particular inhibitory properties, considered as a potential therapeutical agent and evaluated on lens tissue and animal models at the state-of-the art lab in Alberta. 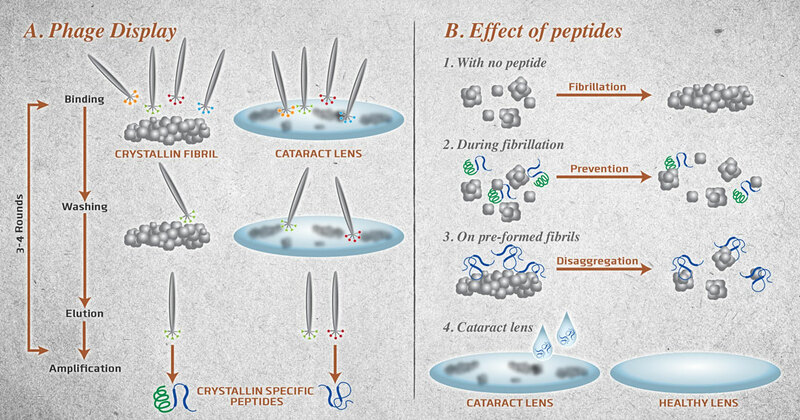 An added benefit to identifying peptides that bind to crystallin aggregates, is that their application extends beyond the treatment of cataract. While the hope and goal is that the peptides themselves will serve as a biologically based, mild, non-invasive treatment, these molecules could also serve to selectively target affected areas of the lens for delivery of other therapies. The ultimate vision of course is to develop an easily administered medication that stops the eye disease in its tracks. Working together, biochemists, engineers, chemists, physicists, and clinicians at Ingenuity Lab are gaining a better understanding of the unique chemical, mechanical, electrical and magnetic properties of nanoscale materials every day. These findings will not only contribute to prolonged eye health for global populations, they will be instrumental in supporting other revolutionary nanomedicine advances including; personalized drug delivery, improved healing times and increased therapeutic advantage. This exciting cataract research is definitely something to watch. 2 Bloemendal, H., et al. (2004) Ageing and vision: structure, stability and function of lens crystallins. Progress in Biophysics & Molecular Biology. 86, 407-485. 3 Delaye M, Tardieu A. Short-range Order of Crystallin Proteins Accounts for Eye Lens Transparency. Nature 1983; 302: 415-17. 4 Muchowski PJ, Valdez MM, Clark JI. alpha beta-crystallin selectively targets intermediate filament proteins during thermal stress. Investigative Ophthalmology & Visual Science 1999; 40: 951-58. 6 Reixach N, Adamski-Werner SL, Kelly JW, et al. Cell based screening of inhibitors of transthyretin aggregation. Biochemical and Biophysical Research Communications 2006; 348: 889-97. 8 Gibert B, Simon S, Dimitrova V, et al. Peptide aptamers: tools to negatively or positively modulate HSPB1(27) function. Philosophical Transactions of the Royal Society B-Biological Sciences 2013; 368.